ON the back of economic uncertainty caused by the recent plunge in crude oil prices and the weakening of the ringgit, demand for office space is anticipated to slow down as companies reduce their 2015 budget for capital expenditure and put expansion plans on hold, says Knight Frank Malaysia managing director Sarkunan Subramaniam in presenting The Edge/Knight Frank Klang Valley Office Monitor 4Q2014. “There may be fewer leasing enquiries on office expansion or relocation from selected industries, such as the oil and gas sector, due to the low oil prices. For example, Petronas is looking to reduce its capital expenditure for new projects by 15% to 20% and will not proceed with new contracts for marginal oilfields,” he adds. During the period under review, the Kuala Lumpur office market remained resilient with overall occupancy and rental rates holding steady. The completion of Menara Hap Seng 2 with about 326,000 sq ft brought the cumulative supply of office space in KL city to about 48.96 million sq ft while cumulative supply in the KL city fringe — with no completions — remained at 21.48 million sq ft. 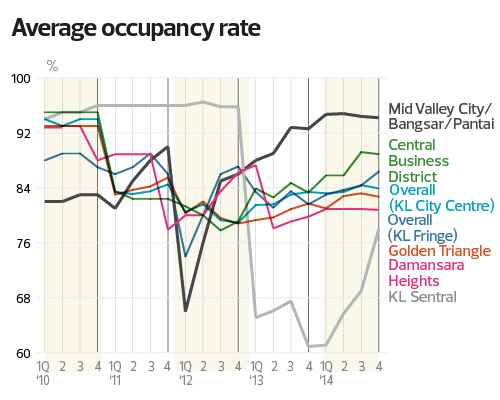 Thus, there was 70.44 million sq ft of purpose-built office space in total in KL in 4Q2014. Office space is projected to increase by about 19% from 2015 to 2017 as the current total under construction stands at 13.42 million sq ft — 5.06 million sq ft in KL city and 8.36 million sq ft in the KL city fringe. Scheduled completions with a combined net lettable area (NLA) of about 700,000 sq ft that have been deferred to 1Q2015 are that of Menara MBMR in Mid Valley City, Crest Jalan Sultan Ismail and Menara Ken @ TTDI in Jalan Burhanuddin Helmi. Sarkunan believes the widening gap between supply and demand will continue to exert pressure on rental and occupancy rates as developers and landlords compete to source for and retain tenants. To prevent a potential glut in the market and to space out supply, there may be a need to review the timeline of proposed or planned projects, he notes. Despite the challenging environment, net absorption continues to be positive, recording an increase of about 11.9% from 2013 to about 2.3 million sq ft last year. Net absorption was estimated at about 650,000 sq ft in 4Q2014 or an increase of 85.1% quarter on quarter (q-o-q) due mainly to improved occupancy in several prime office buildings, such as Menara Binjai, Menara Darussalam and Menara 238 in the city centre, and Nu Towers and Menara Kembar Bank Rakyat in KL Sentral and Brickfields respectively. Sarkunan feels the continued effort of the Malaysian Investment Development Authority and InvestKL bodes well for the KL office market. Tasked with attracting 100 of the world’s largest multinational corporations (MNCs) to set up their regional headquarters or innovation and talent hubs in Greater KL by 2020, InvestKL has, to date, secured 42 of them. “Well-located, good grade, Green Building Index-certified and MSC-status office space will continue to be in demand, maintaining high occupancy and competitive rental rates,” Sarkunan says. Overall, occupancy rates continued to hold steady with a dip of just 0.59% q-o-q to 83.9% in KL city because of the entry of Menara Hap Seng 2, which has yet to be significantly tenanted. The Golden Triangle (GT) recorded a 0.6% drop from the previous quarter due to movements at Menara Weld and Menara Dion, averaging 82.7%, while the central business district (CBD) saw a 0.34% dip and averaged 88.9%. 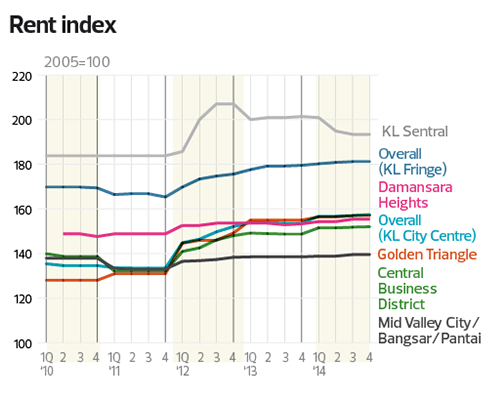 Rates in the KL city fringe improved 2.46% from the previous quarter to 86.3% due to several movements in KL Sentral’s (KLS) vicinity. Recording an improvement of 13.04%, rates at KLS averaged 78% due to movements in Nu Towers and Menara Kembar Bank Rakyat. However, rates in Damansara Heights/TTDI (DH/TTDI) and Mid Valley City/Bangsar/Pantai (MVC/Bangsar/Pantai) dipped 0.12% and 0.21% and averaged 80.8% and 94.2% respectively. Rents remained stable with a 0.33% improvement q-o-q in KL city to RM6.11 psf per month and remained unchanged in the KL city fringe. 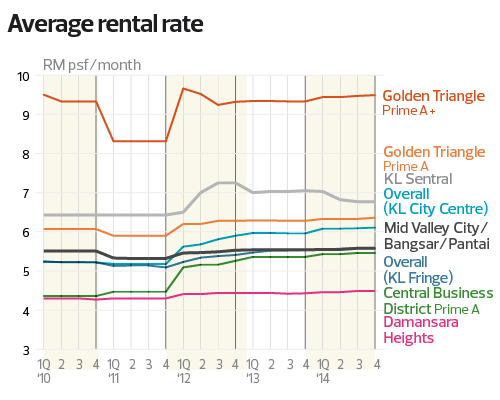 In the GT, rents rose 0.16% to RM6.40 psf while in the CBD, they remained unchanged at RM4.82 psf. In DH/TTDI, KLS and MVC/Bangsar/Pantai, rents stayed at RM4.49 psf, RM6.77 psf and RM5.58 psf respectively. In the GT along Jalan Raja Chulan, Tower REIT, which had an NLA of 160,413 sq ft and occupancy rate of 94% as at Dec 31, 2013, entered into a sale and purchase agreement with Goldstone Kuala Lumpur Sdn Bhd on Dec 29 last year to divest 19 office parcels and 190 parking bays in Menara ING for RM132.34 million cash or RM825 psf. Meanwhile, the injection of Platinum Sentral into Quill Capita Trust is expected to be completed early this year. The property, at RM740 million, will account for 89% of the trust’s current asset base of RM828 million and will see the entry of Malaysian Resources Corp Bhd as a major shareholder with a roughly 31% stake. The construction of Menara Dayabumi Phase 3 by KLCC Property Holdings Bhd (KLCCP) will commence this year and is slated for completion by the end of 2018. It involves the redevelopment of Citipoint Podium into a 60-storey tower comprising 600,000 sq ft of office space and a 500-room hotel. KLCCP has secured a tenant for the office space and identified a hotel operator but would not say who they are. A subsidiary of Singapore-based Oxley Holdings Ltd — Oxley Rising Sdn Bhd — has to resubmit plans for the proposed development of the prime piece of land in Jalan Ampang after two of its earlier applications to the local council were rejected. The latest revised proposal that was rejected in September last year was for two towers of 53 and 64 storeys, featuring 765 serviced suites, 308 hotel rooms and 450 offices atop a 9-storey retail podium and a multi-storey car park. There are plans by Sunway Real Estate Investment Trust to acquire Wisma Sunway for RM60 million. The 19-storey office building, which is located in Seksyen 9, Shah Alam, has an NLA of 171,544 sq ft (RM350 psf) and 382 parking bays. Meanwhile, Ekovest Bhd plans to launch its 1.38-acre EkoPark Place in Jalan Pahang this year. The project features a 33-storey block of Grade A offices. Some notable movements were recorded in prime buildings in 4Q2014, including Menara Darussalam (Roc Oil Malaysia [Holdings] Sdn Bhd occupying 21,000 sq ft), Menara 238 (Royal Malaysia Police occupying 75,000 sq ft), Menara Kembar Bank Rakyat (subsidiaries of Bank Rakyat occupying 80,000 sq ft) and Menara Hap Seng 2 (MSIG Malaysia occupying 100,000 sq ft). MSIG was the previous anchor tenant of Menara Weld, occupying 80,000 sq ft. In the Nu Towers, EcoFirst Consolidated Bhd, Monster Technologies Malaysia Sdn Bhd and L’occitane Malaysia will together occupy 40,000 sq ft in Nu Tower 1 while Tenaga Nasional Bhd will take up 28,000 sq ft in Nu Tower 2. In Menara Binjai, Land Lease Projects (M) Sdn Bhd and BAE Systems Detica (M) Sdn Bhd are undergoing expansion and will occupy 24,000 sq ft in the building. The University of Hull has set up its Malaysia office in Empire Tower 2, Empire Subang. The university has chosen Malaysia as its central point in Asia and has officially opened its regional hub in KL to support students from the region.